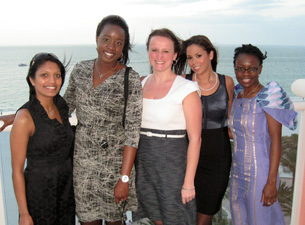 Radhika Nakrani, Yemi Ajayi, Joanne Cyganowski, Daniella Vega and Abimbola Sunmonu at the networking dinner. 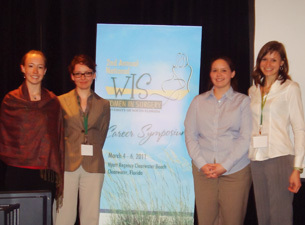 Several UConn medical students attended the second annual National Women in Surgery Career Symposium held recently at the University of South Florida in Clearwater. The symposium focused on issues and challenges facing women who choose a surgical career, while encouraging mentorship and empowering women to expand their career goals and pursue leadership positions. “I could not have imagined a more enriching experience, we had the opportunity to speak to so manyinfluential women and get advice on the road ahead,” says first-year medical student Olayemi Ajayi. “I think it is extremely important for medical students to get exposure like this to their field of interest. It was important for me to see these women and listen to their presentations on career choices, their practices and even their families." The UConn students were able to interact with women who are leaders and pioneers in the field. The symposium was directed by Dr. Sharona Ross of the University of Florida. Keynote speakers included Dr. Nancy Asher, professor and chair of the Department of Surgery at the University of California San Francisco and Dr. Julie Freischlag, professor and chair of the Department of Surgery and surgeon-in-chief at The Johns Hopkins Hospital in Baltimore. Other symposium speakers included the Health Center’s Dr. Linda Barry, assistant professor of general surgery. "It was inspiring to meet accomplished surgeons who are strong leaders, not just strong female leaders," says fourth-year student Lindsay Bliss. "The symposium content addressed many issues, including mentorship and career planning that are important for any young physician." Even though the number of women attending medical school has steadily increased over the years, the number of them choosing to specialize in a surgical career remains low. While the reasons why remain unclear --- lifestyle considerations or lack of role models --- there is a concerted effort toward increasing that number as the need for general surgeons becomes more urgent. That’s one of the reasons first-year medical student Joanne Cyganowski is starting a Women in Surgery group at UConn. “We believe that by getting together, sharing information, networking and receiving mentorships we can help to increase the number of women interested in the field of surgery and help stem any future shortage,” says Ajayi. Fourth-year students Kristina Ziegler, Aleksandra Ogrodnik, Lindsey Bliss and Cheryl Bilinski.